This wedding flower idea guide will help you plan and organize your wedding flowers. From the ceremony through the reception, the right flower choices can have a huge impact on the decor and feel of your wedding. Primarily does weddings or large events. Fits your style. A good florist should have books or online galleries. Offers to meet with you to discuss your ideas and thoughts. Listens to your ideas. Look to your florist for guidance, but they should be willing to work with your ideas and special requests. Is reliable and has the appropriate insurance coverage. Has references that you can call. Don't be afraid to get creative with your flowers. Experiment with unique containers instead of regular vases, and try adding accent items like fruit, vegetables and coffee. The checklist below can be used when determining what flowers you will need for your wedding. 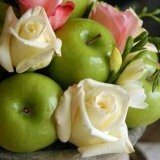 Wedding Flowers By Season - Find the best flowers for your season. Fall Wedding Arrangements - Autumn ideas for flower arrangements. Fall Wedding Flowers - Ideas for fall weddings. Spring Wedding Flowers - Spring ideas for wedding flowers. Summer Wedding Flowers - Ideas for a summer wedding. Winter Wedding Flowers - Ideas for Winter wedding flowers. Blue Wedding Flowers - Add some blue to your wedding day. Pink Wedding Flowers - Colorful options for your big day. Purple Wedding Flowers - Brighten up your wedding day. Garden Wedding Flowers - Surrounded yourself with beautiful flowers. Tropical Wedding Flowers - Perfect for your tropical or beach wedding. Bridal Bouquet Design - Bouquet ideas and tips. 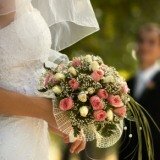 Cost of Wedding Flowers - Get the facts. Fake Wedding Flowers - Are silk flowers right for your? Wedding Floral Centerpieces - Using flowers in your centerpieces.